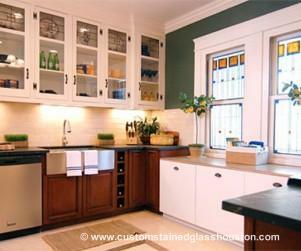 Scottish Stained Glass is well known in Houston and nationwide for creating the highest quality stained glass windows for more than 20 years. Our local artisans combine the same ancient stained glass techniques used by Scottish craftsmen for centuries, with the most modern materials and installation techniques. Although most people consider stained glass to be all about beauty and elegance – and it certainly is that – it can also have some very practical benefits. 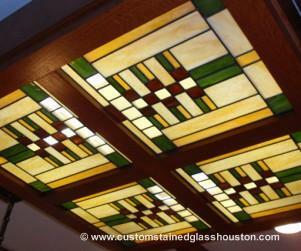 For residents of Houston, stained glass of our handcrafted quality adds value to a home or commercial building. It can also add privacy and uniqueness to a home’s entryway or bathrooms, and a feeling of exclusivity to a salon, spa, office, or high-end restaurant. And it can block an unappealing view, replacing it with something stunning, without blocking the natural flow of light into the building at the same time. 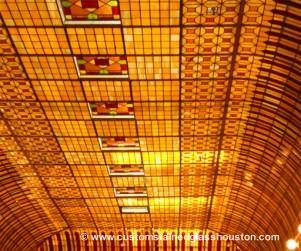 All our Houston stained glass panels are manufactured and installed to local building codes and meet the most modern energy efficiency standards. As the largest stained glass studio in the U.S. today, we have produced and installed custom stained glass windows for more than 12,000 satisfied customers to date. Owner Martin Faith emigrated from Scotland over 25 years ago. He brought his native land’s stained glass expertise with him. Over the past 25 years, Martin has used traditional methods as a starting point for developing his own process. 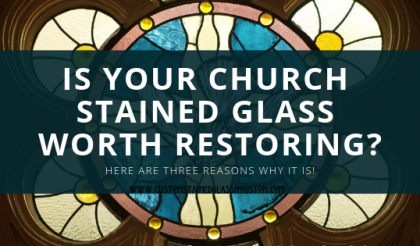 It includes modern methods for hiding the points where the leading (known as “caming”) joins together, darkening the lead to an antique looking finish, and a proprietary polishing process which makes Scottish Stained Glass windows glow, even without the help of the sun. Our stained glass designers work one-on-one with clients, taking in the client’s existing architecture and décor, and the client’s personal tastes. During the initial design consultation, clients have the opportunity to discuss their ideas and look at many samples, sketches, and photographs, while collaborating with one of our local Houston designers. Back in our studio, the custom design process continues using CAD and photo-shop technologies to create beautiful works of art that exactly conform to clients’ needs and specifications. Please take a good look at the detail and quality shown in the lovely photographs below, or visit our design galleries to see more examples of our workmanship. Of course, you take great pride in your Houston home, carefully finding the perfect furnishings that delight you and the artwork that inspires you. 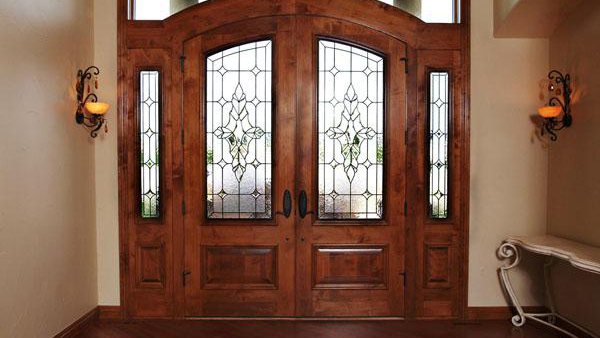 If you are looking to add beauty, value, and distinctive style to your entryway, windows, doors, sidelights, transoms, and skylights, we hope you’ll consider us. We would love to earn your business. Over the years we’ve found that our residential clients truly appreciate vividly colored stained glass but generally prefer something a bit more subtle and elegant for their homes. Our most popular type of residential stained glass is actually colorless, made with frosted, textured, and gorgeous beveled stained glass. This works with any color scheme and lets in as much natural light as possible. 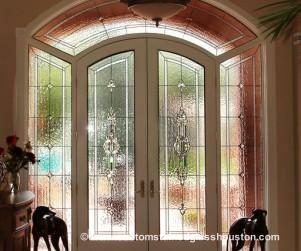 In business for over 20 years, we’ve installed over 40,000 custom stained glass windows for delighted customers. 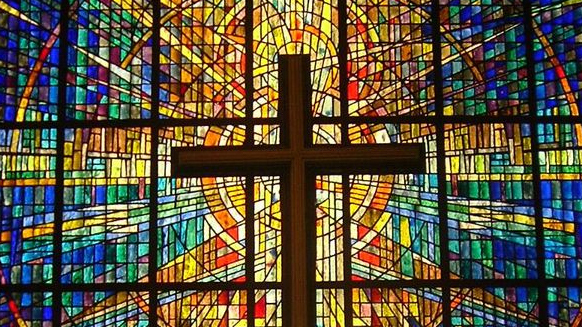 As the largest stained glass studio in the U.S., we have the experience, the talented artisans and the technical expertise to design and install any type of stained glass panel, including replicas of ancient stained glass and antique stained glass restoration as well. 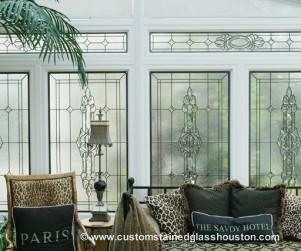 Our Houston stained glass is available in a wide variety of styles, from classic Celtic and romantic florals, to Frank Lloyd Wright inspired modern designs and our own signature Aspen collection. However, you will be working to create your custom design with one of our talented pros, so if you have your own ideas those can be easily accommodated as well. 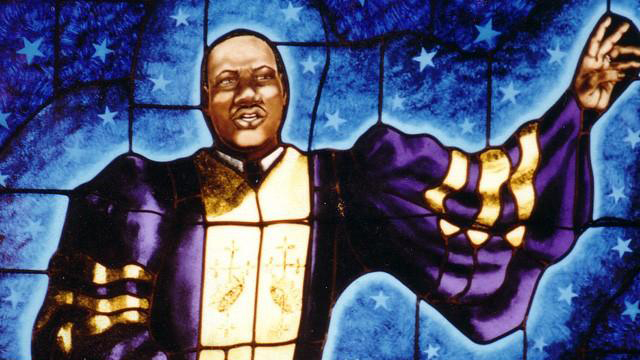 Browse through our design galleries for some Houston stained glass inspiration. 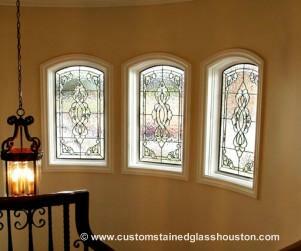 We find many Houstonians have long admired stained glass, but have never realized how affordable, practical and easily installed it is. Our prices start as low as $80 per square foot. 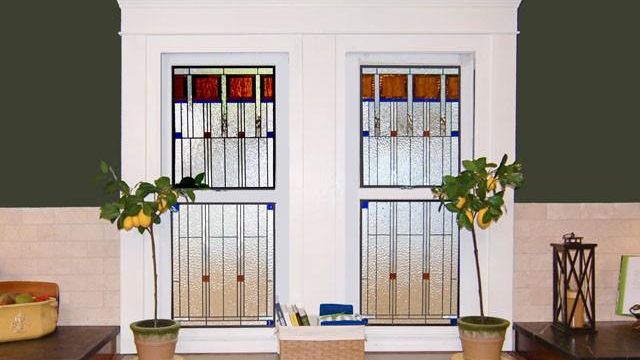 As for the practicality aspects, stained glass windows afford greater privacy where necessary, or block an undesirable view with the use of textured glass. All this, while still letting the natural light stream through into your home. 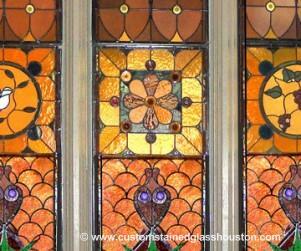 Contact Custom Stained Glass Houston today for your free quote! 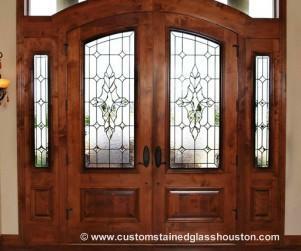 Contact us today for a free, in-home consultation with a stained glass designer. They will show you samples, ideas, and offer suggestions. 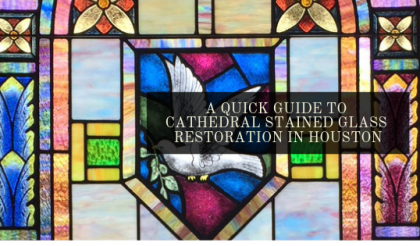 If your home is an older style, they will even research what style of stained glass windows would provide an authentic complement to its history. Please let us earn your business! Scottish Stained Glass is active in social media, so you can find out about us and see what we do in many different ways. Follow us on Facebook, or check out the beautiful photos of our work on Flickr. 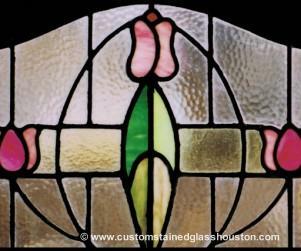 If you are looking for custom designed stained glass in Houston or anywhere across the Lone Star State, please contact us by phone or using our convenient online form. Sometimes, you just a break from life. Taking a few moments at the end of a long day to unwind and relax can help you stay sane. 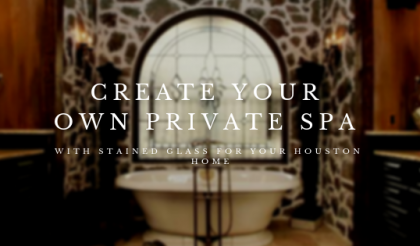 Now if only there was some place you could escape to at the end of the day without having to spend a fortune… Why not create your own personal private space in your home? 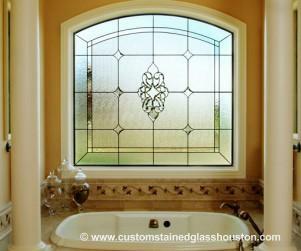 By installing stained glass for your Houston home’s bathroom, you can give your bathroom an elegant, soothing atmosphere you can retreat to at the end of a long day and relax in the comfort of your own home.